Since GD & TOP made their comeback, they have released a total of 3 music videos, High High, Knock Out as well as Baby, Goodnight. 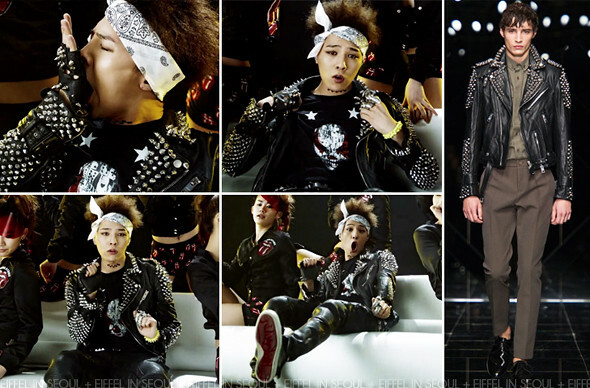 G Dragon was seen wearing 2 different outfits from Burberry Prorsum Menswear Spring/Summer 2011 in Knock Out music video. He first wore a studded Burberry Prorsum leather outfit with Givenchy Clown Printed Jersey Shirt, Christian Louboutin sneakers and a bandana. Then, other outfit he wore was a studded vest from the collection. Completing his outfit with white glasses, pink MCM leather gloves as well as bright pink jeans.